Fast Draw clubs and shooters are always looking for sponsors for local or major competitions. Because we do not use 'live' ammunition in the sport (only blanks and wax bullets), contests can be held in public areas. In fact, of the major competitions held in the last few years, almost all of them were held in public places. Locations of these major championships included city parks, fair grounds, ranches, car dealerships, football fields, and city streets which had been closed off to traffic. Locations of the many smaller contests locations included shopping malls, restaurants and amusement parks. Please click here to view some examples of contest sites. Day or weekend long audience attraction potential. 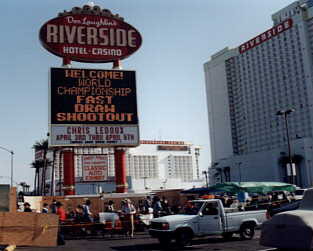 Promotion of a unique event like a Fast Draw contest can be a great crowd magnet. The sound of the gunfire alone will attract people. Inclusion of local dignitaries and media people in a celebrity contest held in conjunction with the main event ensures media coverage. We support our sponsors' advertisement with appearances and interviews. Publicity within the Fast Draw world and the World Fast Draw Association magazine, Top Gun. The Fast Draw club or shooter organizing the contest will be able to handle almost all details relating to the match. This includes providing the targets, timing equipment, organizing the sanction for the competition and notifying potential competitors. Fast Draw clubs and shooters around the United States and western Canada are looking for sponsors for contests. The commitment can range from a few hundred dollars and a place to hold the contest, to tens of thousands of dollars for a major contest. It all depends on what you're looking for in the way of an event. Please e-mail me at Sponsorship@fastdraw.org if you would like to learn more about sponsoring a Fast Draw contest.